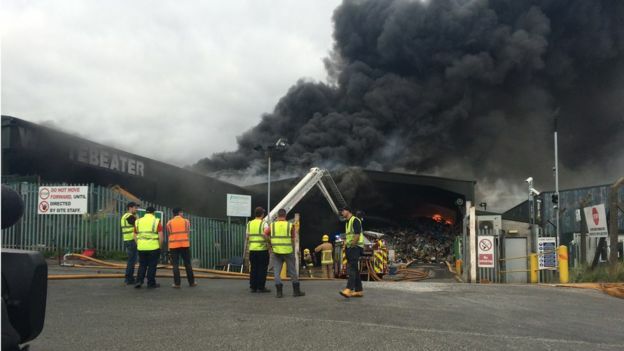 A blaze that broke out at a recycling plant in west Belfast on Wednesday continues to burn. Six fire engines and about 30 firefighters are still in attendance at the Wastebeater facility on the Blackstaff Road, off Kennedy Way. 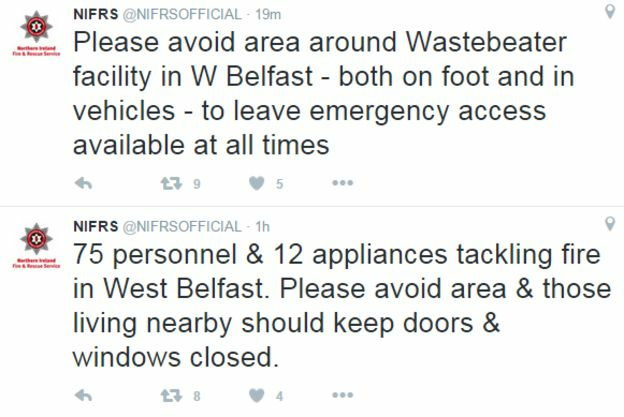 People living near the facility have been advised to keep their doors and windows closed. 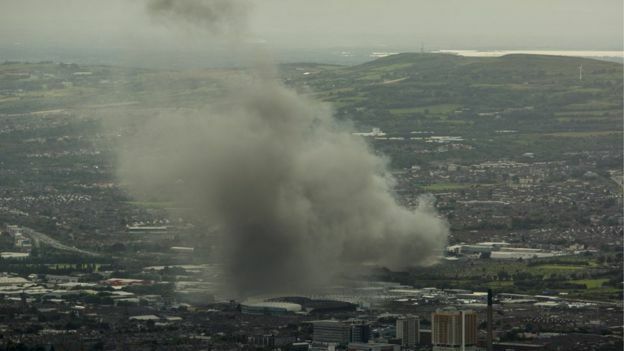 Northern Ireland’s chief fire officer said that the blaze could take up to 24 hours to be fully extinguished. 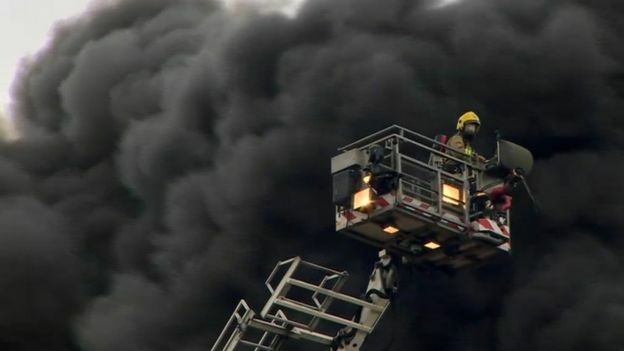 The alarm was raised at 16:00 BST on Wednesday and, at the height of the blaze,12 engines and 75 firefighters were at the scene. 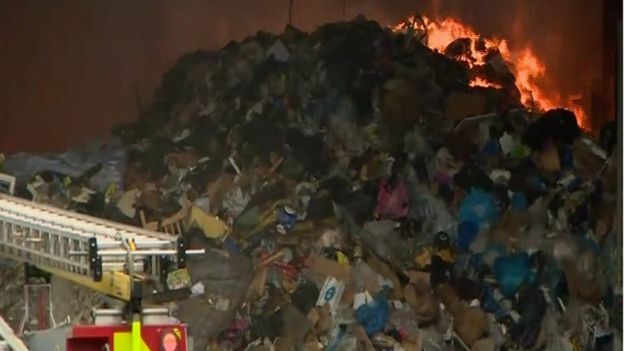 The Northern Ireland Fire and Rescue Service (NIFRS) said that a large quantity of rubbish was on fire, creating a blaze stretching across 120m and reaching up to two floors in height. The Fire Service Area Commander, Aidan Jennings, said on Thursday morning, that they continue to dampen down the fire. “It’s burning both on the surface and smouldering underneath, it is difficult to get access to that. “We need to get into the building and pull that material out and get access and extinguish [the fire] entirely. “The problem we have with that, is that the building has been impacted significantly by fire. “Therefore we are assessing this morning structural integrity to see if we can access [the building],” he added. He said preventing the spread of the fire had been the firefighters’ first priority when they first began tackling the blaze. 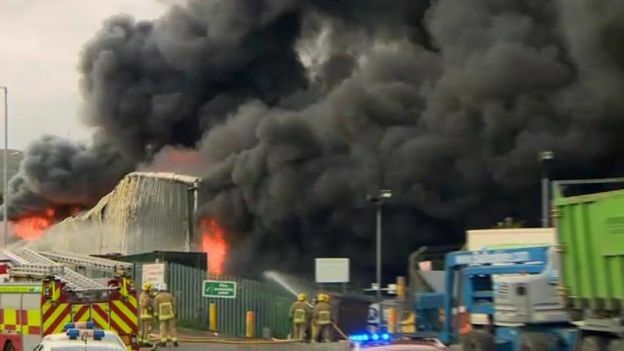 SDLP West Belfast MLA Alex Attwood said that the nature and scale of the blaze raised serious questions about the location of such plants. Mr Attwood said: “This is clearly a very serious incident and there is some suggestion that the fire may burn for a very long time yet. “Given the scale of this fire, the noxious burning and the substantial inconvenience caused to local residents and businesses, we must hope that it can be extinguished quickly. “An incident of this nature must, however, raise serious questions. Key among those – should a plant of this nature be located in such close proximity to a residential neighbourhood, located close to other businesses or located in an industrial/manufacturing park? 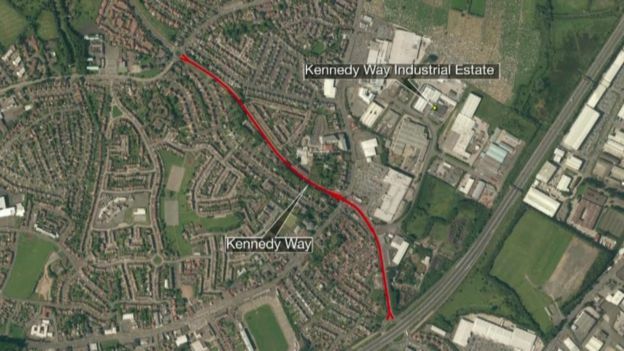 However, West Belfast MP Sinn Féin’s Paul Maskey defended the plant’s location. “It’s been here for over fifteen years, and this is the first incident. “I think they have a good track record,” he said. A spokesman for Wastebeater said: “We acknowledge the inconvenience caused to local people and we will do all that we can to minimise disruption over the hours and days ahead.